I was lucky enough to take a workshop with John Salminen In February 2016, please see more on my blog by clicking here. During the five days of the workshop I asked his permission to take a few photos to paint his portrait. I usually do not do portraits, but I wanted to give him a gift for all that I have learnt, reading all the articles about his work. I have pored over the articles about him and seen the step by step progress of his paintings, in many art magazines. Needless to say, I admire his work greatly, as they touch one emotionally, not just cerebrally. But during the workshop, he showed us the process he follows as a watercolorist, by planning in detail ahead, doing a detailed drawing and executing the painting swiftly and with confidence at first, then going in to do the really fine and painstaking work. I took my time to paint it, as it would not just do to paint something that did not quite look like him. 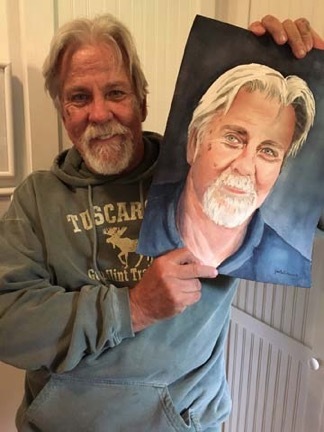 After I sent it to him, he and his lovely wife, Kathy, sent me a picture of John holding his portrait, which I painted in watercolor (16" x 12").